The Athleisure Outfit to Try When the Invite Says "Formal"
Sequin dresses and sleek tuxedos are red carpet staples, but a tracksuit? Not so much. While we all love the comfort and ease of a sleek athleisure look, it's not the thing we first reach for when it's time to dress up. Yet, thanks to expert stylist Karla Welch, you have all the proof you need that athleisure can be plenty fancy. 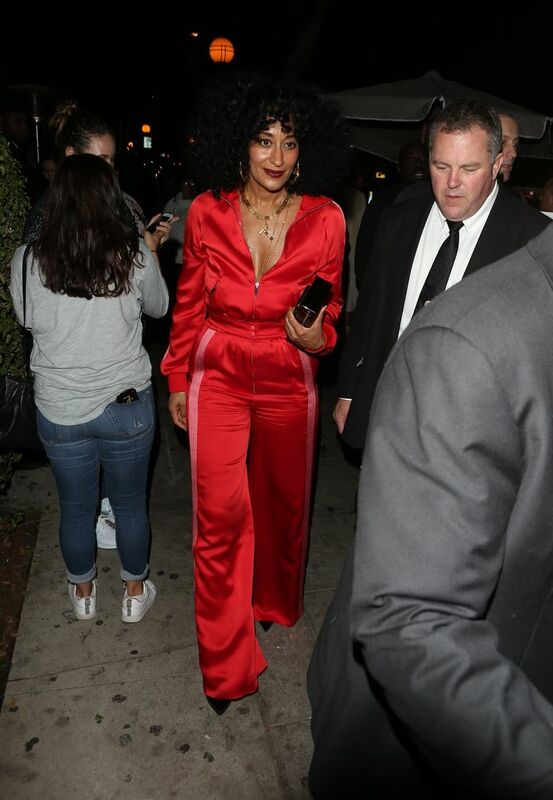 Welch and client Tracy Ellis Ross attended Marie Claire's Image Makers Awards last night in L.A. dressed in coordinated red Valentino tracksuits. From the half-zipped jacket to the silky sleek material to the use of dressed-up accessories, Welch and Ross broke fashion boundaries and offered a lesson in making formal dress actually comfortable. While cotton sweats or running sneakers may be better reserved for off-duty dressing, choosing luxe materials and more streamlined silhouettes make a tracksuit feeling perfectly suited to fancier settings. So, being that it's Friday after all, if you're post-work plans involve dressing up, it may be the day to give athleisure a chance. Stylist Karla Welch and Tracee Ellis Ross wore matching tracksuits on the red carpet. Available in sizes FR 34 to 44.